Jihad Watch : The international media eagerly bought and propagated the lie. How much were the various “journalists” involved paid? “Hamas paid the family of baby $2,200 to say she died in clashes with Israeli forces, Gaza infiltrator’s testimony reveals,” JTA, June 21, 2018 (thanks to The Religion of Peace): Hamas paid the family of an 8-month-old baby to say she died during clashes between Arab rioters and Israeli troops, a family member said. 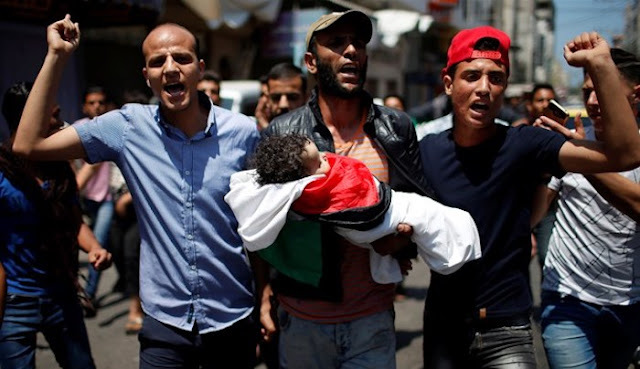 Mahmoud Omar, 20, told Israeli investigators that his 8-month-old cousin Layla al-Ghandour died of a heart disease, the same disease the baby’s brother died from a year earlier. He said he heard about his cousin’s death while protesting at the border in early May. The information was contained in testimony by Omar, filed as part of an indictment in Beersheba District Court on Thursday. Omar, captured attempting to infiltrate Israel through the Gaza border fence, was charged with several security offenses including membership in a terrorist organization, terrorist activity, and attempted infiltration, according to Hadashot news. He reportedly is a member of the Al-Aqsa Martyrs Brigades, which promised financial aid to his family. Omar testified that Hamas paid his aunt Mariam and her husband Anwar 8,000 shekels, or about $2,200 to say their daughter died from exposure to tear gas at the border riots. The baby’s death inflamed passions and led to a deluge of condemnation against Israel for its response to the border riots. At least 120 Arab operatives, including dozens of members of local terror groups, have been killed during the more than two months of rioting, according to Gaza officials.